Have you thought what happens to these lions you walked with after they are too big and dangerous to do so? Walking with lions is the second phase of the lion farmers brutal exploitation of captive lions. 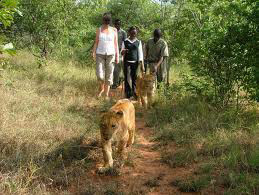 The lions are trained to walk with one group of tourists after another, day in and day out. Tourists think only of themselves when they want to take a selfie with young lions to show their friends. No one thinks about the miserable life or the dismal fate of these lions. Some young lions are even reduced to the status of a lab rat. Darted, often many times, for questionable research by grant- funded academics. When these lions become too big to be trusted to walk with tourists, they are returned to the breeder to be crammed into overcrowded enclosures, to be grown out until they reach huntable size. This is when the adult lion is sold for canned hunting and placed into a fenced camp. There he will die in agony, either from a hail of bullets or by a rain of arrows.